Watering succulents get weird in winter. Fancypants have elaborate ways of watering their wintering succulents and my dream is to install a fully-automated system that will water each plant at the right time with the right amount. This system, of course, will also have the ability to know which pot to water when and how much. Yeah. White Walkers on Unicorns, too. Using a hose is the obvious thing, especially if you have a lot of plants. I don't like flood in my basement, though. I don't like drip trays under my pots and I don't like using watering cans. And if you have as many haworthias and mesembs as I do, you really won't want to get these things wet indoors in winter. So pump sprayer it is. These are available in in the US in one, two and three-gallon sizes or probably larger. I have a one-gallon one and you're supposed to fill it up to the mark where it says one gallon. The rest of the space is for building up air pressure so that you get a fine mist. 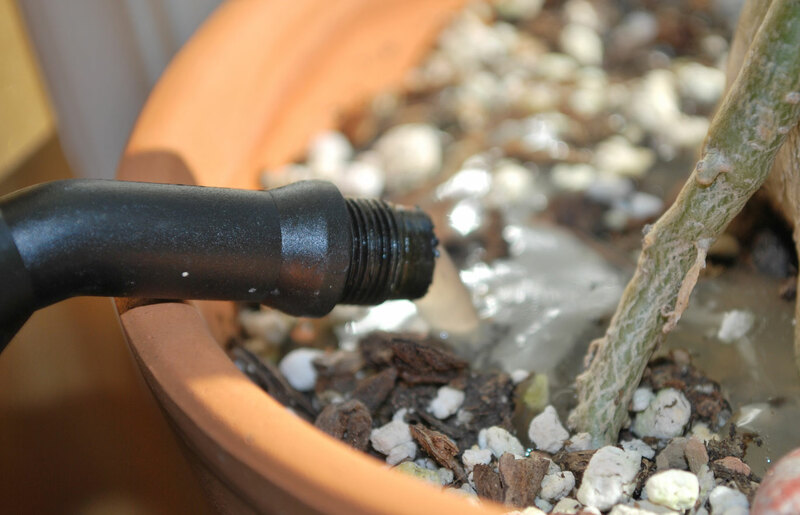 A fine mist is good for the mass application of stuff like neem oil but this is not how you want to water succulents; that will just kick up so much moisture and put them on the leaves instead of the roots where plants absorb water. 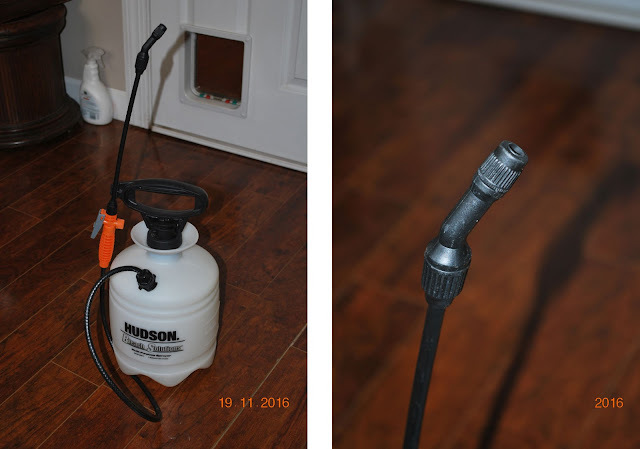 A pump sprayer like this just does not stream water. Even at its most loose setting, water will still come out in a jet and even with minimal air pressure in the canister, that jet will still be strong enough to aggravate the grit in the pot. If you are watering over fifty 5-cm pots filled with loose pumice, that gets irritating pretty fast. So. What to do? 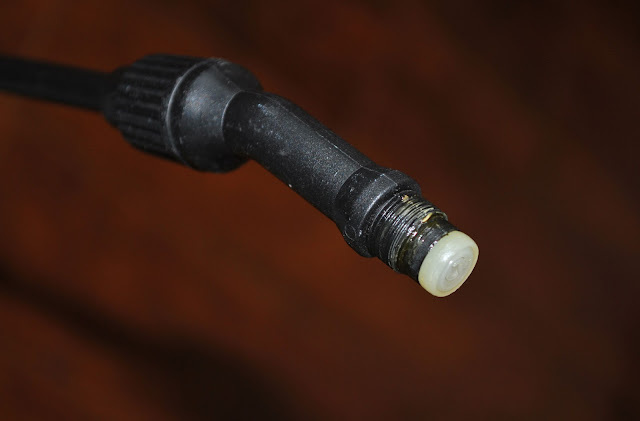 First, unscrew the tip like so. You probably should put that thing away in case you want to reassemble this thing later. 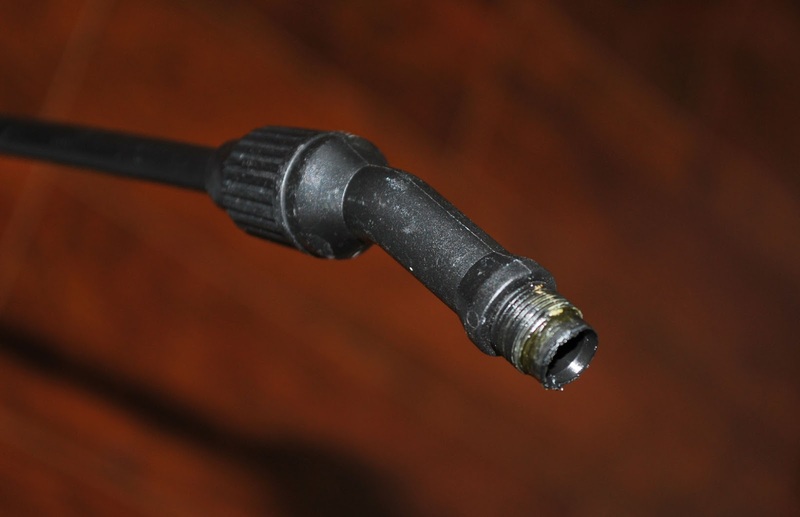 Then remove that white plug. It just pries out, but the best tool is a pair of long-nosed pliers. Just wiggle it out. Again, put it away because you might want it back. Voila. Long slender wand with streaming water.